What boards are you using? Any suggestions on kite specific wake skates that work well in normal conditions (the same power needed for a regular twin)? This board I would also like to use at the cable-park. i will get in contact with them and as soon I have more information I'll post it here. the full name is sir rowdy correct? unfortunatelly I don't find a person with the name Kermit. I think he might have gone underground from seabreeze...another lost leader. He actually has cred and is not in anyway associated with lorocopter. Aka best wave indo close out wave rider with multiple personalities and alieses and Cray Cray issues from kite mafia. AXIS build Rowdy's Planq wakeskate. any AXIS dealer can supply to you. do you know what is the difference between the 2017 and 2018 model? Because in Europe you can still buy both versions. Almost gone, but not quite... the sport that is . The difference between 2017 and 2018 is that the 2018 model is slightly longer and slightly wider. So if you're a bigger rider I'd suggest the 2018 model if possible. However I doubt most people would notice. In general you want to be a bit more powered than normal twin-tip riding, just take a size or two bigger especially at first as it will help you get the hang of it. I weigh 85kg and my height is 183cm. would this be a bigger rider for you? if not and I would go for the 2018 model it would not make such a difference that the I could use the same kite size than with a twin tip, correct? will it be possible with more experience on a wakeskate to ride the same kite size as on a twin tip? The reason why one would not build Kiteskates in the size of twintips would be that one cannot do the tricks so easily? Is this the reason why they are so small? Will I feel the difference between a normal Wakeskate and a Kiteskate when kiting? why do you think is that? Until this week I was not even aware that there is/was the possibility to wakeskate with a kite! which is sad because I think the sport has potential. Because it combines strapless (what a lot of people are doing because it is new) and doing tricks, which is probably even easier and faster to learn than on waveboard, or? could it be that the only reason why no one did it, the size of the kite is? or was the time not right? When will the 2019 version of the wakeskate be on the market? Yes you are a bigger rider (similar to me). I can ride the same size kite as a twin-tip board suited for boots, but in choppy or gusty conditions you may need a little more power (maybe one square meter). Yes. The wakeskates are small so the tricks can be performed properly and look good. You can make a bigger wakeskate if you like, but suddenly doing a proper looking ollie or flip trick on one isn't really possible. That's not to say a bigger wakeskate can't be fun. Yes. There's a small difference between the two. Namely rocker. 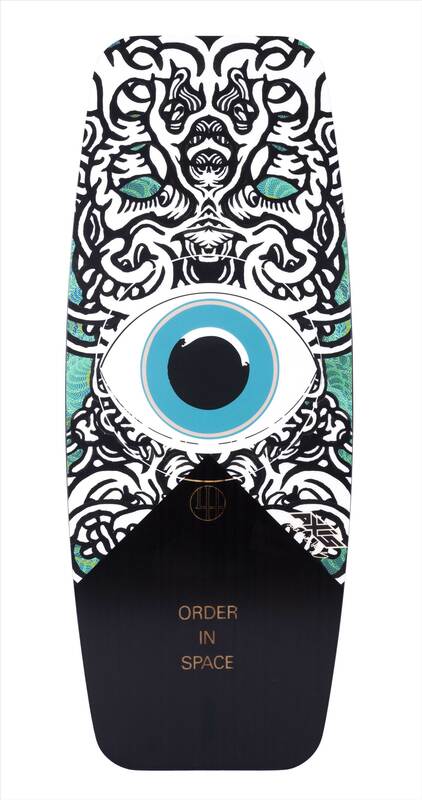 Usually a normal Wakeskate has quite aggressive 3-stage rocker which makes getting speed and going upwind hard. They will work, but you might need to ride a bigger kite again. I was just joking. However many aspects of the sport are going around in circles, sometimes backwards, competitions for one. That said some things are also moving forward. Don't for a second think that a Wakeskate will be an easier option than a surfboard for learning tricks. Doing tricks properly on a wakeskate Vs on a surfboard take a considerable time longer to learn, it will be frustrating, but that's also what makes it fun ??. Not many people do it because it's hard! They don't want to spend the time looking like a kook to learn the tricks. I'm not sure if there will be a 2019 version yet. One more thing... do i feel a difference with a kiteskate in the cable-park compared to a wakeskate? Take the fins and bindings off your girlfriends shortest twin tip with the most aggressive rocker profile. pay 22 dollars for a pair Dunlop volleys and off you go. As said above choose a kite 1 to 2m larger than normal (as strap positions make use of all available surface area; inefficient position, drag, = massive pop). Kick flips, heel flips and 360 shovit flips will come easy if your already landing them on a skateboard, the kite gives you an extra second or 3 to stomp it! I think this is a misunderstanding. Do I feel a difference when using a KITESKATE (Axis Planq) instead of a Wakeskate in the CABLE-PARK. No, it will feel the same. hahaha. Post up those "easy" kickflip, heelflip and 3 flip clips when you've got them . I'm sorry but this thread has been far to civil and far too useful for someone. There has been courteous, informative dialogue and it has to cease. Can it pleae stop or at least the moderators step in. Thankyou. Laurie make it stop, we can't have this precedence be set.